Keeping your home or business in good, working order requires a lot of effort. Each and every piece of your home requires a special type of attention and your windows are a prime example of this. Windows aren’t just viewpoints, they provide your home with light, warmth and security. The least that we can do is keep them clean! Our Squamish window cleaning aims to do just that. Keep all the benefits of bright windows without spots, streaks or stains. Cleaning is part of a daily routine. As much as you might dislike it, there is no way around cleaning. Instead of simple decluttering or the wiping down of surfaces, your windows demand a more delicate touch. Instead of grabbing a simple blue cleaner and a roll of paper towel, a proper Squamish window cleaning requires a few more steps. The first thing that you should note is that your windows are a porous material. This means that the longer dirt and other materials are allows to sit against your windows, the more damage that it does. Foreign materials can soak into the pores of your glass, degrading it from the inside out. Over time, this can lead to replacements or repairs. Save yourself some trouble (and money) by choosing routine maintenance instead. When it comes to your Squamish window cleaning, the right tools make all the right difference. Preventing static charge against glass is key in keeping the surface of windows cleaning for longer. Rubber squeegees prevent just that. The rubber edges of these tools block static from forming, as well as allows us to clean out ever corner and groove within your windows. This is not limited to glass, either! Sills and frames can break down if left to collect debris. 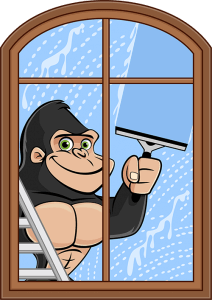 Gorilla technicians are careful to clean both of these areas, extending the life of your windows with every servicing. If you are concerned that your windows might be out of reach, the use of water-fed poles gives our Gorillas access to windows up to four storeys.